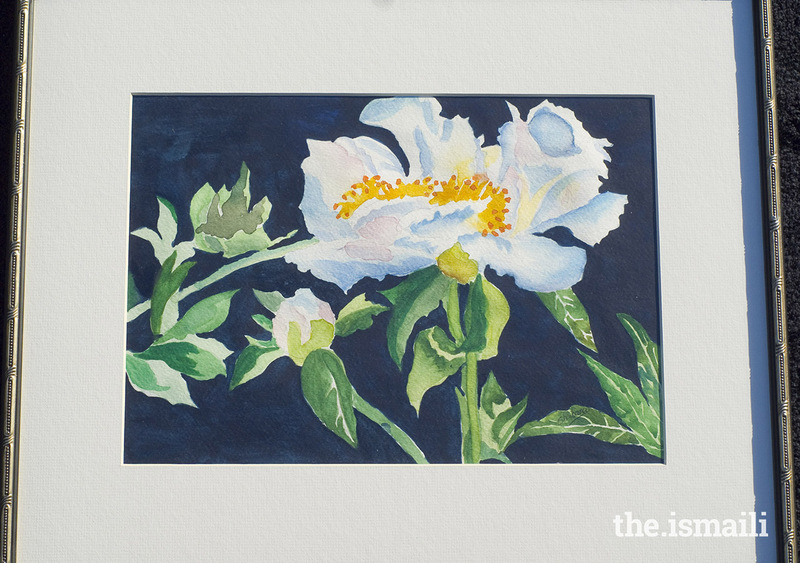 Art has been shown to be of therapeutic value, creating a sense of calm, engaging creative areas of the brain and offsetting depression, especially in older adults, offering a valuable pastime for everyone to consider. 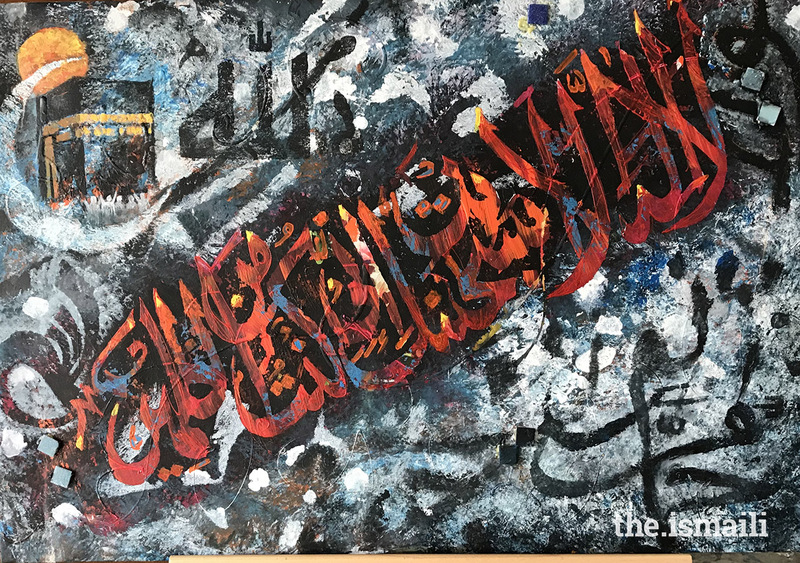 Here, we feature the works of four artists, all senior members of the Jamat, who arrived in the US from different countries, and who display their cultural sensibilities in their colorful creations. "I never finished my education because they weren't teaching me what I was interested in," said Chicago's Madadaly Rajabaly (Madhu), who studied art with the Cultural Council of Pakistan, before moving to the United States. During his time in art school, however, he took graphic design courses, and eventually opened his own graphic design agency. At age 76, Madhu continues to create art that enthralls viewers. His mastery of technique, shading and color, as well as his ability to capture an accurate representation of his subjects, is evident from his portraits, which are his passion. Although he has concentrated on portraits for most of his artistic life, Madhu has begun to produce work that is more abstract and symbolic and includes Islamic influences. One reason why he includes these symbols in his work is to foster a better understanding between different cultures. "I think every human being in his/her lifetime finds themselves at a crossroads where they have to confront this vital question, 'What is God, what is the meaning of life, what is this all about?'" Madhu says. 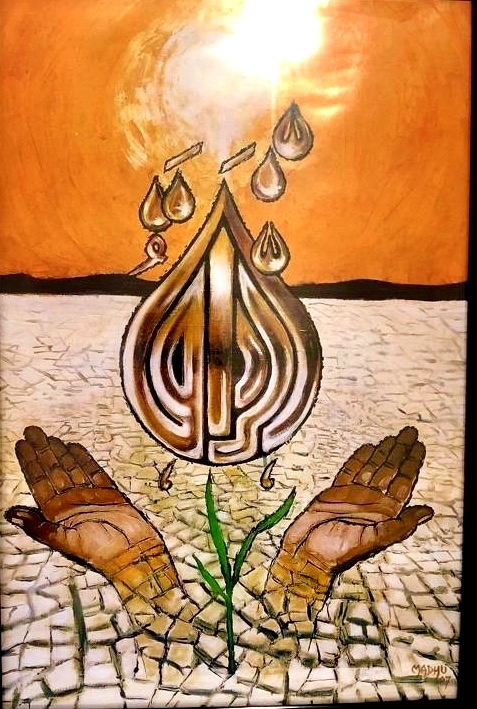 Several of his pieces have been exhibited at the Hanover Park Community Center, including one titled Al Razzaq (the Provider), one of the 99 names of God, depicted as a water drop, the source of life. The varied colors represent the diversity and unity of the human race, with water providing relief to a parched earth, and the blade of grass symbolizing new life and hope; A fitting image to reflect Navroz. Another of his paintings, of the Governor Rauner of Illinois, hangs in the Governor’s office. Other works seek to reflect the ways in which we search for the Divine, and the meaning of life, illustrated through images of the cosmos and mathematical equations. All of these attempts, Madhu noted, will fall short. "We are like fish in the ocean, surrounded by God all of the time," he remarked. Techniques, color combinations, and values, are what Sherbanoo Aziz concentrates on when she paints her canvases. Tonal contrast creates visual interest or excitement in a painting. “If the center of focus is dark, then things around it, I make light,” she said. Intriguing color combinations allow the focus to stand out and varying techniques offer paintings diversity. Sherbanoo took her childhood desire to be an artist to a serious level in 2007, at the age of 73. Prior to that, she experimented with painting as a child in India, but was not encouraged to continue. It was not until she moved to the United States and retired that she began to paint with a group of individuals every week, and then progressed to taking workshops from well-known artists. “I did not believe, at this age, I could still have such passion for this form of art,” explained Sherbanoo. After two years, she sold her first painting, of birch trees and leaves. “As a young child, when I saw artwork on nature, I could not believe they could transform into art what I saw in nature,” she said. When she was young, many paintings she saw were exact replicas of real life. Now, she indicates leaves through a splash of color, rather than paint leaves exactly, and loves painting using watercolors to depict landscapes and cultural images, such as mendhi-covered hands and other South Asian scenes, unusual for a town like Moorhead, Minnesota, where she lives. Exhibitions often feature Sherbanoo's art. She has donated her paintings for charitable causes, and has also taught painting at assisted-living facilities as a volunteer. In 2014, Sherbanoo began working on a traveling Smithsonian Museum exhibit with a group of Indian artists in America, focusing on "Beyond Bollywood.” The museum displayed panels on contributions by Indians in America, including one on her contributions to art and culinary techniques. She has published a third edition of her cookbook Sherbanoo’s Indian Cuisine: Tantalizing Tastes of India, and has been interviewed on local television channels. 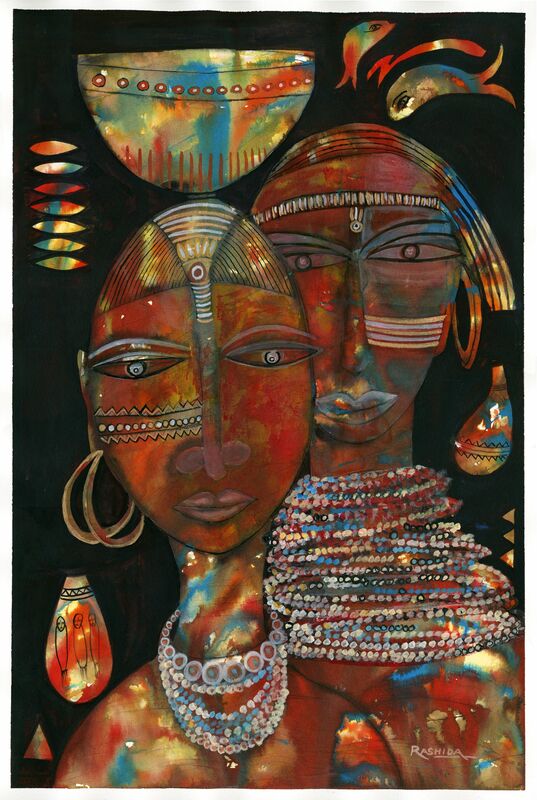 "The blending of different colors and shapes have always fascinated me and I became particularly fond of the vibrant colors of Africa," said Rashida Alibhai, who began to paint in the 1970s, while living in Mombasa. In 1986, she was fortunate to present one of her pieces to Prince Sadruddin while he was visiting the city, and he encouraged her to develop her talent. Although without formal training, Rashida's art has been viewed at several exhibitions, including at the Baas Gallery in Seattle. She has also taught art classes. From the vivid colors of Masai women, with their ornaments that reflect the red ochre earth they inhabit, to images of old Mombasa with its dhows and buildings, she recaptures the memories of her youth and her life in her art, bringing Africa to her new home. Wood is a tactile medium like a sculpted piece of clay. Atlanta's Rajab Noormohamed, now 69 years of age, has fashioned calligraphic and other designs using this natural material. He began creating them during the Golden Jubilee as he loved calligraphy, and was inspired by this historic occasion. Rajab learnt by watching videos and woodworking shows, as well as by assisting with some woodwork for a Jamatkhana in Atlanta. Through trial and error, he honed his craft. 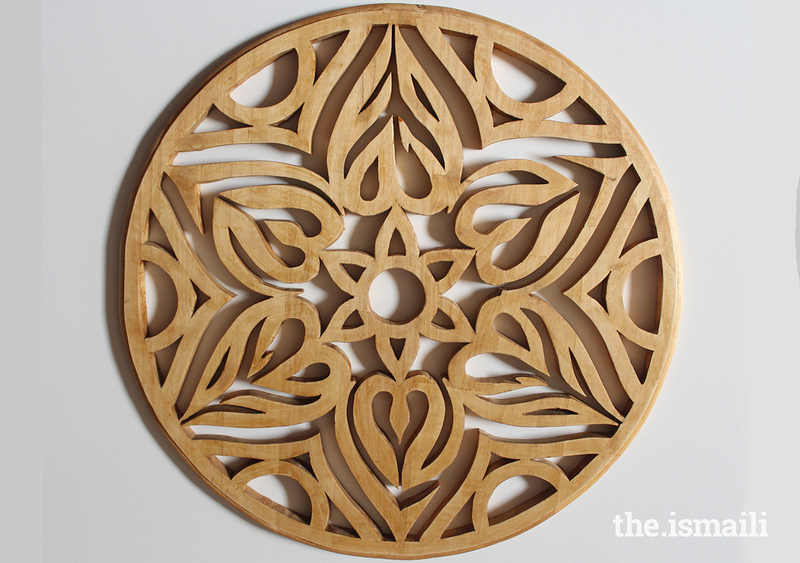 Some designs took 30 hours of careful concentration and steady hands, designing, cutting, sanding, and polishing. Rajab's works are prized and several were donated for a silent auction at an Aga Khan Foundation Walk in Atlanta. Madhu, Sherbanoo, Rashida, and Rajab illustrate that age is no barrier to talent and such hobbies keep them engaged and creative, while offering visual delights to others who learn to appreciate different forms of artistic talent.